LIFX was our runaway favorite bulb in 2015, and the company has hardly been resting on its laurels in the year and a half since. Today’s LIFX bulbs are smaller, cheaper, and brighter, but are just as easy to install and use as the earlier ones. 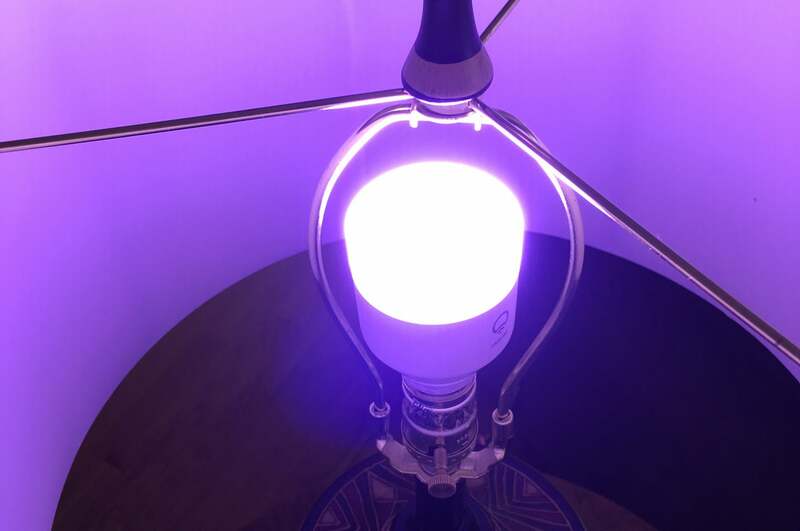 My biggest complaint last year was the gargantuan size of LIFX bulbs, which positively dwarfed other bulbs in its category—to the point where they were difficult to install into a standard lamp. This new LIFX bulb has the same shape but is 2mm thinner and a critical 20mm shorter than the original LIFX bulb, and it weighs nearly 2 ounces less. These are all significant and immediately noticeable when you’re working with the bulb hardware. The LIFX Color 1000 will flicker badly if it's dimmed by either a conventional or Z-Wave dimmer switch. Fortunately, the bulbs haven’t been stripped down to fit into the smaller package. In fact, LIFX has actually boosted luminosity a bit—though its reported 1055 lumens do not feel dramatically brighter than the 800-lumen bulbs in the bulbs we’ve seen lately, particularly the Philips Hue. A lot of that likely has to do with the bulb design, which, in a lamp installation, sends most of the light upwards rather than to the sides. In other installations, such as in overhead or canister lamps, this could be a plus. One of LIFX’s biggest selling points is that it doesn’t require a hub or any other extra hardware to work. 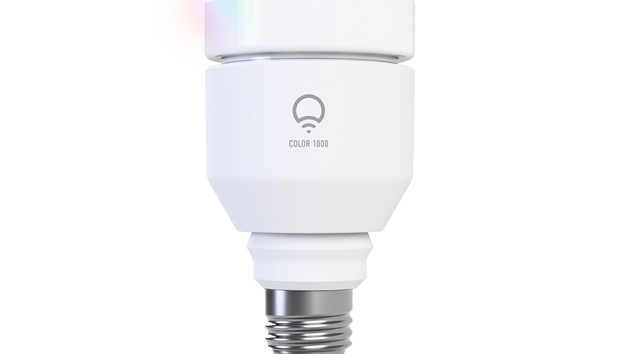 Each bulb connects directly and independently to your Wi-Fi network, still following a quick two-step process of connecting your phone directly to a temporary network created by the bulb, then associating the bulb with your home network. Firmware updates, if needed, are downloaded immediately and relatively seamlessly. It’s easily the fastest bulb to set up outside of Bluetooth models. 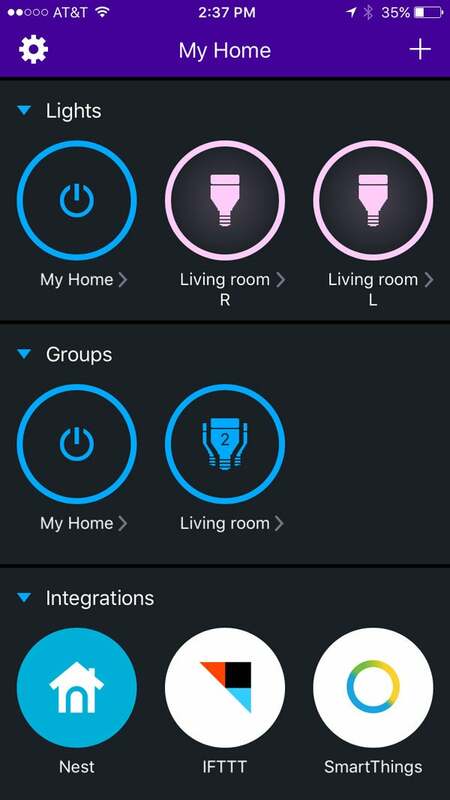 LIFX has developed a great smartphone app to go with its equally fabulous smart bulb. Working with the LIFX app is a breeze. Key controls (on/off for individual bulbs or rooms, if you have multiples in one place) are front and center. A single tap lets you drill down into bulb settings. Switching between a festive color or a specific white temperature is simple, and LIFX’s themes and effects let you give the room a party vibe (right down to the inclusion of a strobe light). The bulbs respond quickly to changes, so you aren’t left in the dark for long when you make tweaks. Colors are accurate and bright, and white light from the bulb is clean regardless of the temperature you choose. If you have a specific temp in mind, there’s no need to guess at it. The app spells out the effective temperature in numbers, in addition to offering a visual representation of its color. Scheduling is perhaps the LIFX 1000’s only real weak link. It’s a bit buried under an unlabeled menu (tap + in the top right corner), and setting up timers takes more work than it should. That’s a minor complaint against an otherwise top-shelf bulb, which also now supports all of the major smart-home hubs, giving you ample options if you want to integrate things more closely with the rest of your home. All told, it’s hard to find fault with the LIFX 1000—though even at the reduced price of $60 a bulb, it remains at the top end of a market that’s had plummeting prices in the last year. Still, its dependability, ease of use, and impressive feature set together make it easy to justify the outlay of an extra few bucks, particularly if you aren’t trying to upgrade the entire house.